Humans have some weird childcare methods. From carrying a baby in a backpack to using a toddler leash, humans get pretty creative with the ways they transport their young. And, of course, so do animals. Below are a few of the oddest, cutest and most unexpected ways animals carry their babies. A mother swan huddles her young underneath her feathers. She's basically a swan boat. He could not be any more comfortable right now if he tried. Here, the pangolin rests her baby where her tail meets her back, and the pangolin has never looked so cute. A jacana has how many legs? Normally, only two, but with three babies under the mother's wing, there are eight total in the photo above. A baby otter floats on what can only feel like a gently swaying paradise. The most comfortable waterbed on Earth. Careful, those teeth are sharp. A lioness doesn't just use her teeth for hunting and tearing apart pieces of meat. She can be gentle too, even during tense moments like the one above when a mother lion saved her cub from a flood. Above, a possum holds an astounding 11 babies on her back. Wildlife can show up in even the most urban places. This photo of a scorpion crawling along with more than a dozen babies was taken in the middle of a skate park. Here, a mother gorilla carries her baby on top of her back, but she's not doing all the work. As you can see in the photo, he's grabbing onto her fur to hold steady. 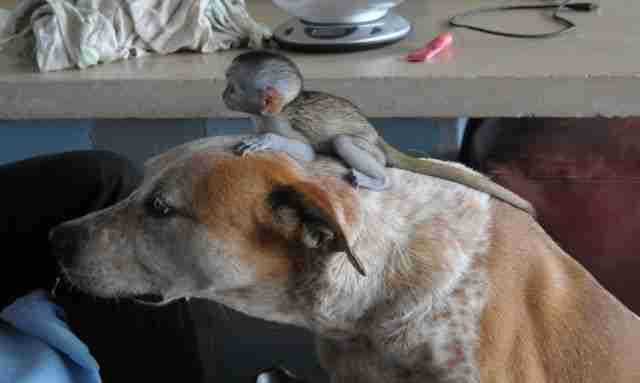 Princess, the pit bull who helps her parents rescue wildlife, carries an orphaned monkey named Laila on top of her noggin. Mothers have a special bond with their children. Whether it's carrying them in their teeth or letting them rest on their bellies as they float down the stream, these mothers will haul their babies anywhere, because in a mother's eyes, the safest place for a child is right by their side. Check out these fierce mothers who will stop at nothing to protect their babies.